Daylight savings time is used to save energy and have more daylight during the summer months. During this time, the clocks are set forward in the Spring and moved back in the Fall. 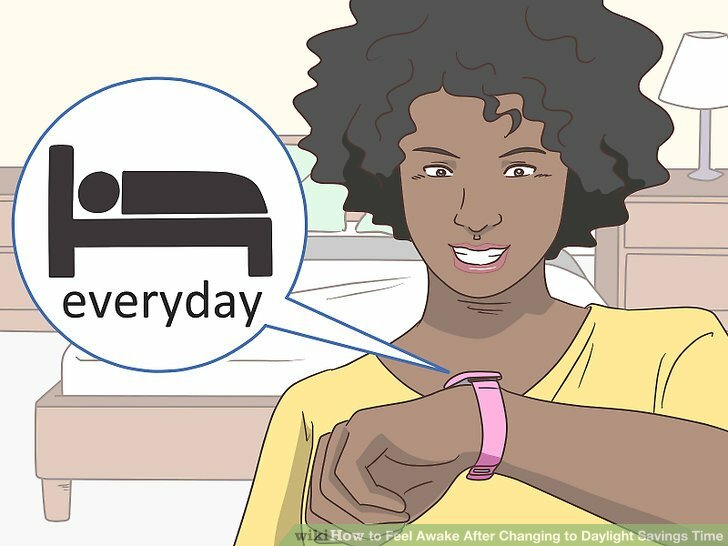 It can drastically alter your sleep schedule, making you feel groggy during the day and can make it difficult for you to be productive at work or school. 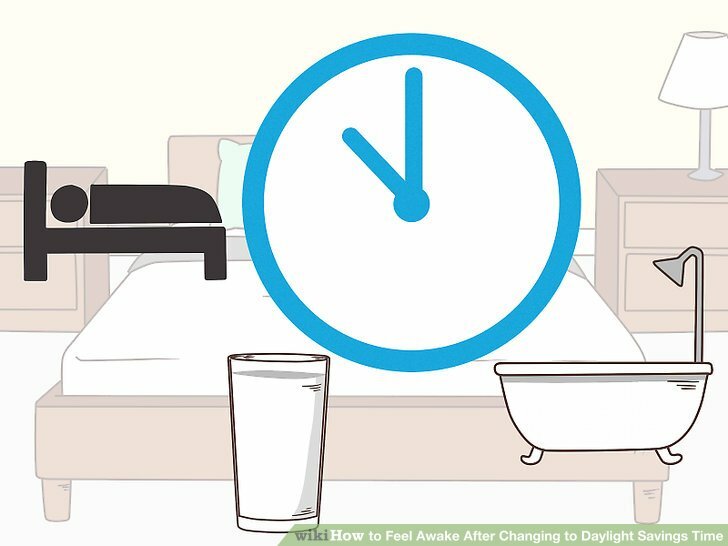 However, if you avoid common mistakes, and adjust your sleep schedule and lifestyle, you can adapt to the time change. Take a power nap. Take 20 minute power naps to energize and invigorate you. These can be particularly helpful during the afternoon. If you have a long lunch break at work or a break between classes, utilize that time to recharge. Naps that are longer than 20 minutes will cause you to enter into deep sleep and you will feel groggy rather than awake afterwards. Avoid these kinds of naps. Get as much daylight as possible. One of the quickest ways to adjust to the new time change is to get as much exposure to sunlight as you can. In the morning when you wake up, open the blinds or go outside for a brief walk. During your day, take a break to go for a walk outdoors or go sit by a window for lunch. Sunlight helps to calibrate your mind to the new time change. The lack of sunlight may reduce the amount of Vitamin D you receive from the sun. This may increase your risk of Seasonal Affective Disorder (SAD) and depression. Exercise in the mornings. 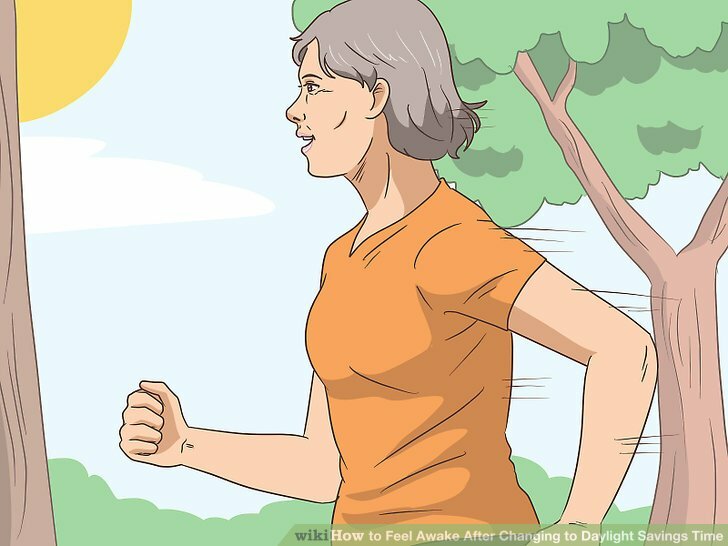 Exercise in general is helpful to assist your body in feeling awake after the time change, but doing so in the morning is particularly beneficial. While still committing to getting eight hours of sleep, wake up a bit early to workout. You will feel energized and ready to begin your day. Consider exercising with friends or taking a group fitness class. Walk around your neighborhood for 30 minutes or so. 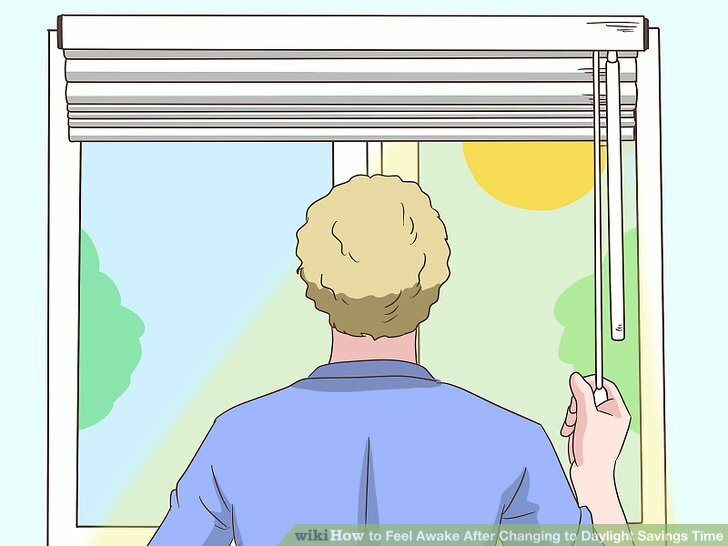 Doing this will also give you the necessary exposure to sunlight that you need. Try a cold/hot/cold shower. One surefire way to wake yourself up in the mornings it to take a shower of varying temperatures to shock yourself awake. Begin by using cold water for a minute or two, then hot water, and then finishing off with cold water. 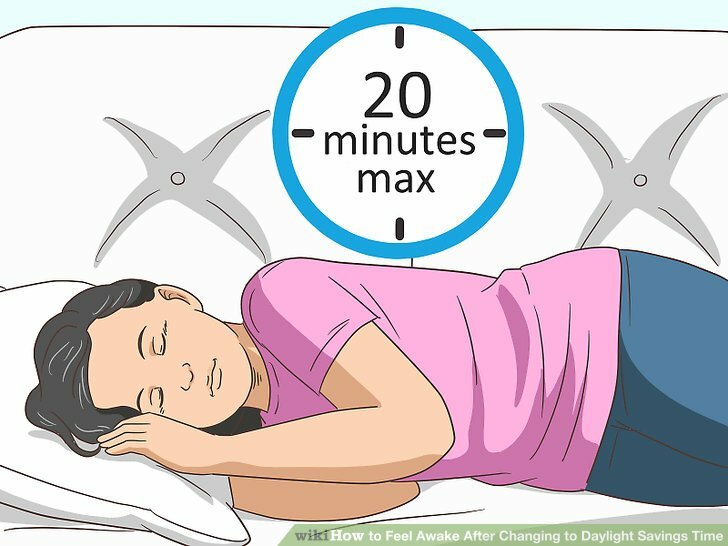 Though a warm shower might soothe you, it can also make you feel more sleepy, so try this method instead to be alert. If you cannot handle the water being cold or hot, try it as cool and warm, instead. Listen to music. Music can be a great way to pump yourself up in the mornings and even during work. Create a playlist filled with upbeat fun songs that are sure to motivate and invigorate you. Listen to it as you get ready, while you commute, and during your day. Don’t listen to music in class, however. Keep your music at a respectful level so that you don’t disturb your coworkers or peers. Practice clean, healthy eating. Another way to give yourself energy after the time change is to eat better. Avoid heavy and fatty foods that are fried or filling but not nutritious. Fill up instead on fruits, vegetables, lean meat and whole grains. These foods will give you the vitamins that you need to have as productive and alert day as possible. Make eight hours of sleep a priority. You may find it difficult at times to get a full eight hours, but begin making this a habit. You will feel much more well rested and will be able to adjust to the time change more readily. 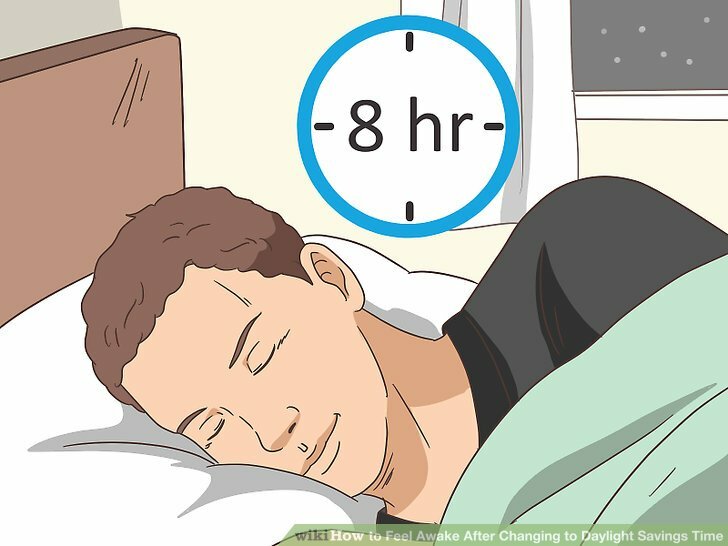 Allot 8.5 hours for sleep each night, with the .5 hour being the time it might take you to fall asleep. Create calming rituals before bed. In order to get the best sleep possible pre- and post-daylight savings time, make sure that you properly wind down before bed. Consistent rituals at night can help tell your body that it you should sleep, no matter what time it is. Avoid watching television an hour before bed and being on your smartphone. You can try to take a warm bath or have a warm glass of milk. Create a relaxing environment in your bedroom. Meditate for fifteen or twenty minutes, listen to soothing music, or practice deep breathing. If you already have rituals that help you sleep at night, continue to follow these as normal. For example, if you read before bed every night, keep doing this. This will signal to your brain that you are ready to go to bed. Go to bed and awaken at the same time each day. As much as possible, try to go to bed at the same time every night, even on the weekends. Establishing a steady routine of sleep will be very useful in combating the sleepiness that often comes with the time change. Utilize eye masks or ear plugs. Make small adjustments to your environment to ensure that you get the best sleep possible during this time. 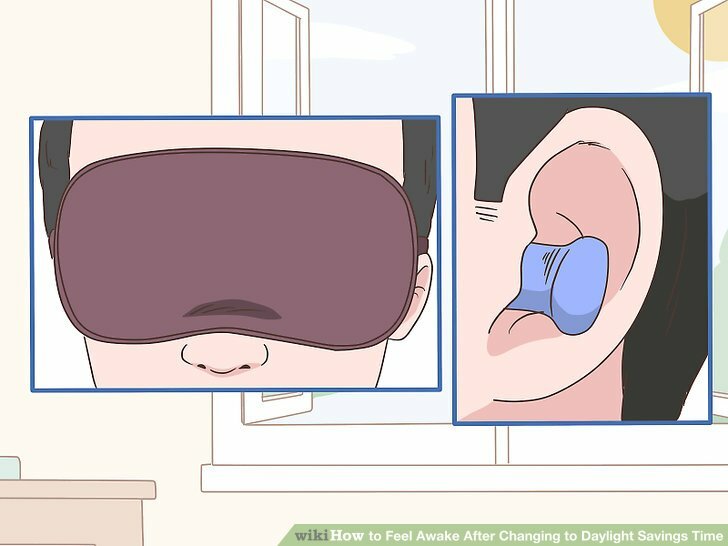 Use eye masks to prevent light from keeping you awake and ear plugs if you live in a noisy environment or have a partner who snores. You can also purchase light cancelling d****s or blinds to keep light out of your room. Consider playing sleep sounds, like rain or the ocean, to help soothe you to sleep. Get ready a few days in advance. You will feel more able to cope with the time change if you prepare for it. Begin adjusting your sleep schedule in advance depending on if the clock is springing forward or falling back. 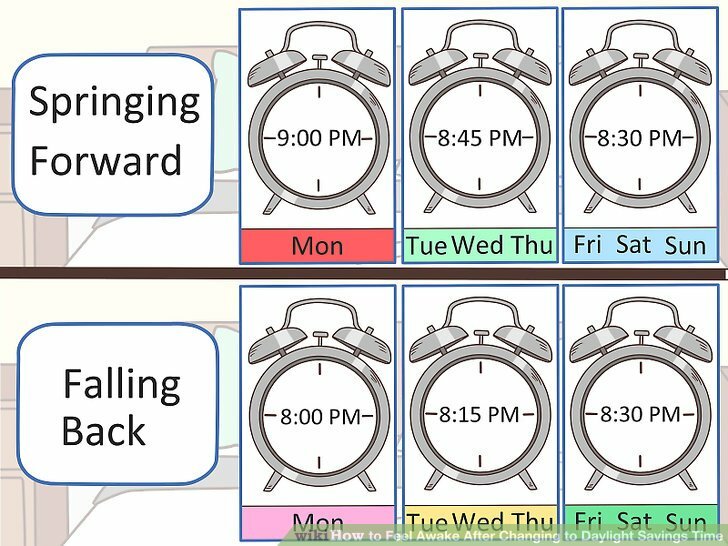 If the former, begin going to bed 15 minutes earlier for three days prior to the time change and then another 15 minutes earlier on the day of. 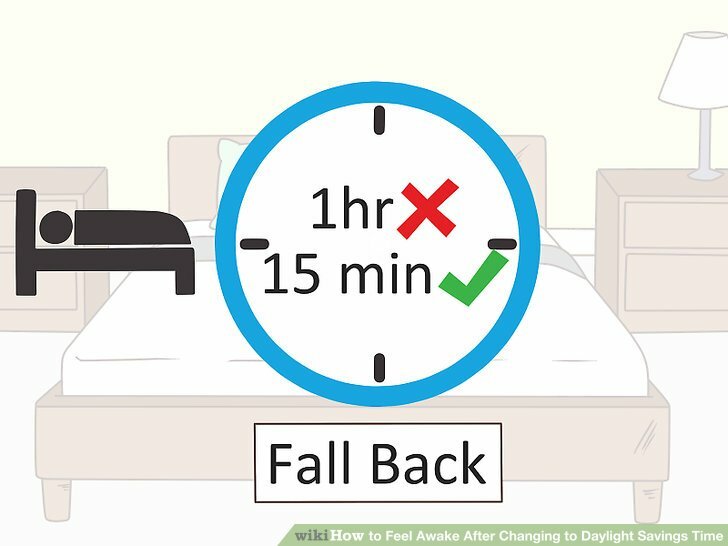 If falling back, do the opposite by going to bed 15 minutes later for a few days. Making small adjustments early will help to ease the transition of the time change. 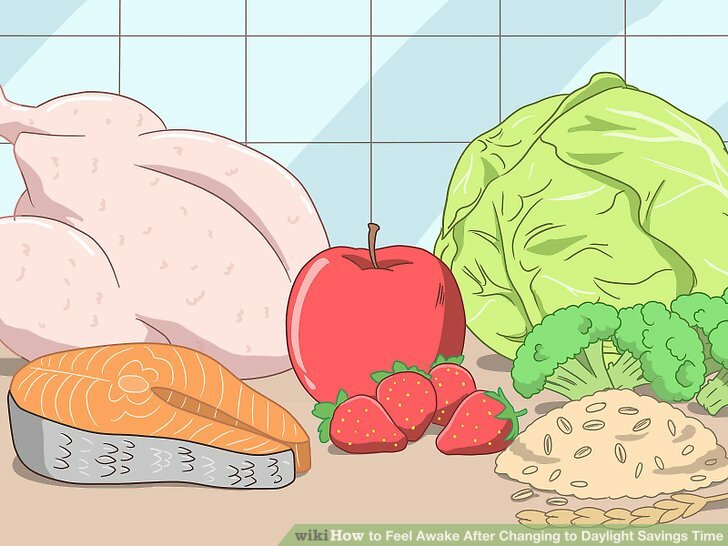 Start making small adjustments to your mealtimes in the days leading up to the time change. Perhaps adjust the start time by ten minutes each day to help your body adjust to the change. 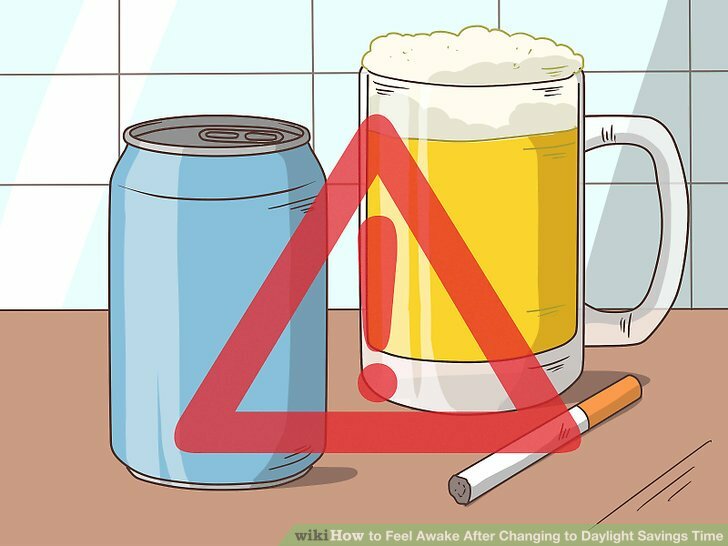 Limit caffeine, nicotine and alcohol until your body is adjusted. During both the days leading up to and after the time change, avoid soda, smoking and drinking. All of these substances can keep you up at night and disrupt your sleep. Once your body has readjusted, you can resume your normal usage of these items, but you might find that you sleep sounder without them. Don’t underestimate “falling back.” When the time is set back, people often overestimate the amount of time they have. You might stay up an extra hour to watch a movie, and that extra hour might turn into two or three. You might even use that extra time to go out on the town, but you will often suffer for it in the morning and in the days that follow. Though your body needs a certain amount of rest, it also typically needs to keep on the same sleep pattern or rhythm in order to achieve the best and most restful sleep. Don’t stay up an extra hour. Go to bed 15 minutes later at a maximum. Avoid long naps. After returning home after a long day, you might be tempted to take a nap. A nap is fine, but taking one that is longer than 20 minutes will cause your sleep later to suffer. Set a timer on your phone to prevent yourself from oversleeping. Practice safe driving. 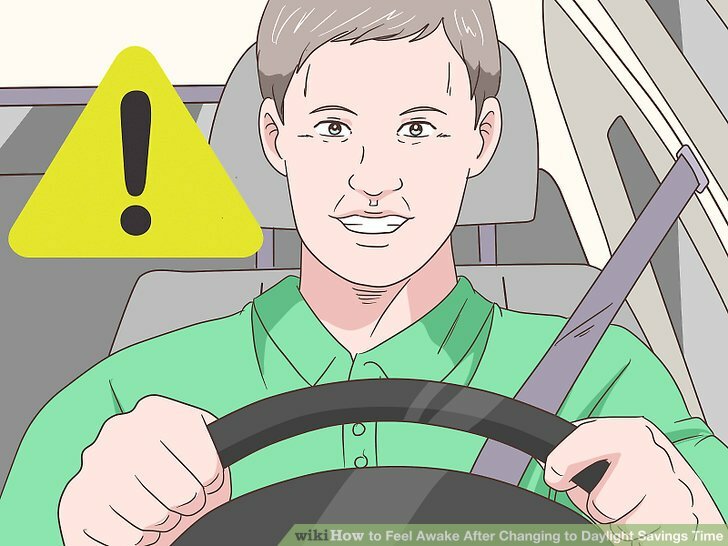 Car crashes tend to escalate by a significant percentage when daylight savings time changes occur. During this time, you will need to be particularly vigilant, awake and aware. 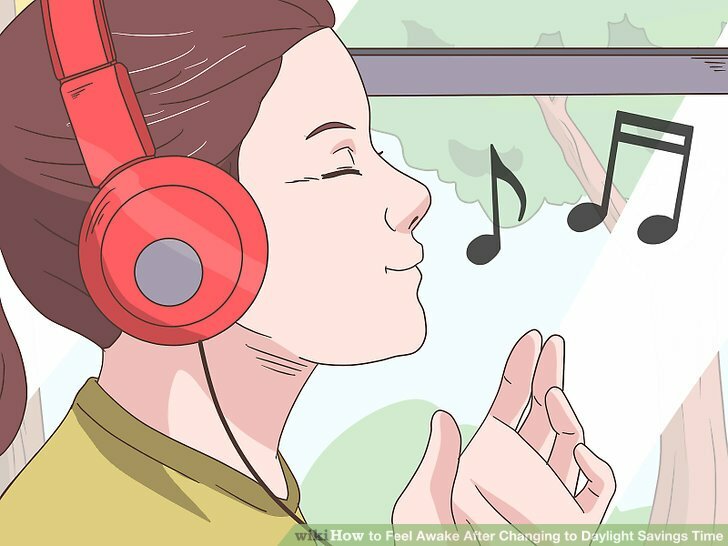 If you are feeling tired, blast your music or roll down your window to wake yourself up. Consider carpooling with friends, as well. If you have bluetooth, call a friend or loved one to chat during your drive. Don’t overdo it at work. 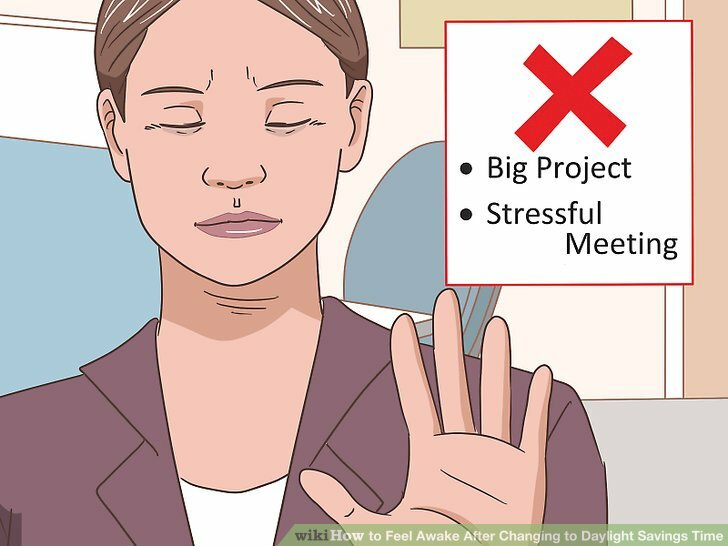 During the days following daylight savings time changes, avoid taking on any big projects at work or scheduling long or stressful meetings during this time. You might not be feeling at your best, so wait until a few days have passed before doing important tasks. Utilize your full lunch break to recharge. Get out of your cubicle and take a walk. Plan your schedule out ahead of the daylight savings time change.